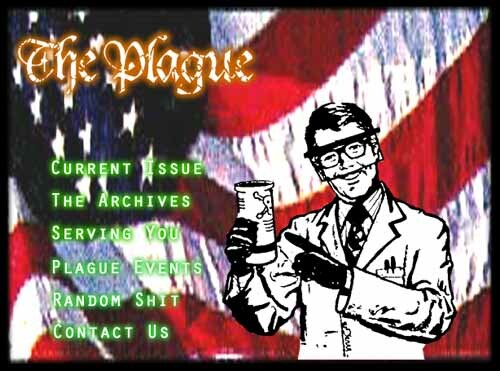 What follows is a brief list of sites for folks that we enjoy and hope you do, too. The home of many a great band, including (but not limited to) Minor Threat, Fugazi, the Nation of Ulysses, the Make-Up, the Monorchid, and the list goes on and on. The greatest trumpet player the world has ever seen. Why are you looking at this when you could be listening to Kind of Blue right now? If you have it, go put on Giant Steps right now. If you don't have it, you deserve a slap. The greatest songwriter of the latter quarter of the twentieth century. His aim is true, you know. Elvis is king. Behind the razor-ripped, whiskey soaked voice is the mind of a genius. A damn jazzy genius too. An otherwordly guitarist, a biting social commentator and one of the twentieth century's best composers. Too good to be true. Find out for yourself. Click here to see one of the best damn shows of the last ten years. JOIN US! The Henry Miller Library One of the greatest authors of the twentieth century, on line where no blue nosed censor can touch him. Once you've given up the ghost, everything follows with amazing certainty. Delve into the darkest reaches of Slavic tomfoolery with Yoni Radzin, NYU student, Russian authority, fierce guitarist/songwriter, Inseminator of trees and flinger of pierogies. NYUs only intentionally humorous publication. Warning: This site has many evil JAVA traps. Proceed at your own peril. Find out how to stick it to The Man, from The Man who started the trend.